This is part 14 of Categories for Programmers. Previously: Free Monoids. See the Table of Contents. It’s about time we had a little talk about sets. Mathematicians have a love/hate relationship with set theory. It’s the assembly language of mathematics — at least it used to be. Category theory tries to step away from set theory, to some extent. For instance, it’s a known fact that the set of all sets doesn’t exist, but the category of all sets, Set, does. So that’s good. On the other hand, we assume that morphisms between any two objects in a category form a set. We even called it a hom-set. To be fair, there is a branch of category theory where morphisms don’t form sets. Instead they are objects in another category. Those categories that use hom-objects rather than hom-sets, are called enriched categories. In what follows, though, we’ll stick to categories with good old-fashioned hom-sets. A set is the closest thing to a featureless blob you can get outside of categorical objects. A set has elements, but you can’t say much about these elements. If you have a finite set, you can count the elements. You can kind of count the elements of an inifinite set using cardinal numbers. The set of natural numbers, for instance, is smaller than the set of real numbers, even though both are infinite. But, maybe surprisingly, a set of rational numbers is the same size as the set of natural numbers. Other than that, all the information about sets can be encoded in functions between them — especially the invertible ones called isomorphisms. For all intents and purposes isomorphic sets are identical. Before I summon the wrath of foundational mathematicians, let me explain that the distinction between equality and isomorphism is of fundamental importance. In fact it is one of the main concerns of the latest branch of mathematics, the Homotopy Type Theory (HoTT). I’m mentioning HoTT because it’s a pure mathematical theory that takes inspiration from computation, and one of its main proponents, Vladimir Voevodsky, had a major epiphany while studying the Coq theorem prover. The interaction between mathematics and programming goes both ways. 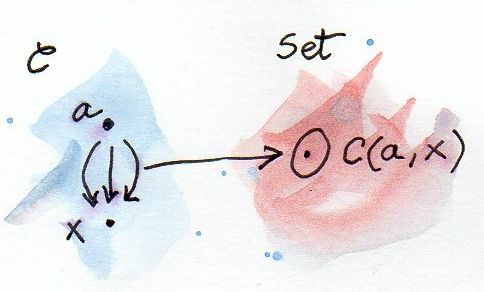 The important lesson about sets is that it’s okay to compare sets of unlike elements. For instance, we can say that a given set of natural transformations is isomorphic to some set of morphisms, because a set is just a set. Isomorphism in this case just means that for every natural transformation from one set there is a unique morphism from the other set and vice versa. They can be paired against each other. You can’t compare apples with oranges, if they are objects from different categories, but you can compare sets of apples against sets of oranges. Often transforming a categorical problem into a set-theoretical problem gives us the necessary insight or even lets us prove valuable theorems. Every category comes equipped with a canonical family of mappings to Set. Those mappings are in fact functors, so they preserve the structure of the category. Let’s build one such mapping. Let’s fix one object a in C and pick another object x also in C. The hom-set C(a, x) is a set, an object in Set. When we vary x, keeping a fixed, C(a, x) will also vary in Set. Thus we have a mapping from x to Set. with the dash serving as the placeholder for the argument. is a morphism going from a to y. It is therefore a member of C(a, y). is also a functor. It is, but instead of being covariant, it’s contravariant. That’s because the same kind of matching of morphisms end to end results in postcomposition by f; rather than precomposition, as was the case with C(a, -). We’ve seen that, for every choice of an object a in C, we get a functor from C to Set. This kind of structure-preserving mapping to Set is often called a representation. We are representing objects and morphisms of C as sets and functions in Set. The functor C(a, -) itself is sometimes called representable. More generally, any functor F that is naturally isomorphic to the hom-functor, for some choice of a, is called representable. Such functor must necessarily be Set-valued, since C(a, -) is. I said before that we often think of isomorphic sets as identical. More generally, we think of isomorphic objects in a category as identical. That’s because objects have no structure other than their relation to other objects (and themselves) through morphisms. For instance, we’ve previously talked about the category of monoids, Mon, that was initially modeled with sets. But we were careful to pick as morphisms only those functions that preserved the monoidal structure of those sets. So if two objects in Mon are isomorphic, meaning there is an invertible morphism between them, they have exactly the same structure. If we peeked at the sets and functions that they were based upon, we’d see that the unit element of one monoid was mapped to the unit element of another, and that a product of two elements was mapped to the product of their mappings. The same reasoning can be applied to functors. Functors between two categories form a category in which natural transformations play the role of morphisms. So two functors are isomorphic, and can be thought of as identical, if there is an invertible natural transformation between them. Let’s analyze the definition of the representable functor from this perspective. For F to be representable we require that: There be an object a in C; one natural transformation α from C(a, -) to F; another natural transformation, β, in the opposite direction; and that their composition be the identity natural transformation. We will see later that a natural transformation from C(a, -) to any Set-valued functor always exists (Yoneda’s lemma) but it is not necessarily invertible. You might think of retrieving an x from the list, e.g., using head, but that won’t work for an empty list. Notice that there is no choice for the type a (in place of Int) that would work here. So the list functor is not representable. Notice that the representing type, our a, which is called Rep f here, is part of the definition of Representable. The star just means that Rep f is a type (as opposed to a type constructor, or other more exotic kinds). Infinite lists, or streams, which cannot be empty, are representable. It’s interesting that you can implement a single memoization scheme to cover a whole family of functions with arbitrary return types. 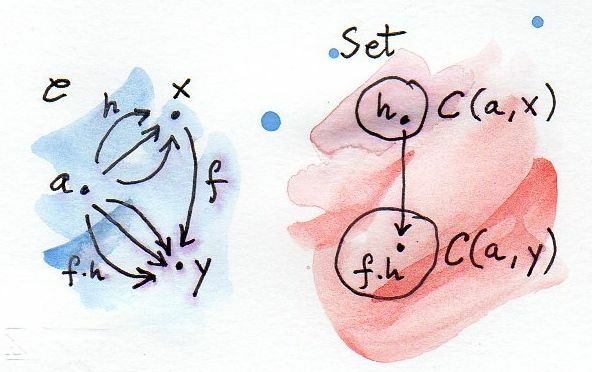 Representability for contravariant functors is similarly defined, except that we keep the second argument of C(-, a) fixed. Or, equivalently, we may consider functors from Cop to Set, because Cop(a, -) is the same as C(-, a). Of course, this is a purely formal transformation, but if you know some of the properties of logarithms, it is quite helpful. In particular, it turns out that functors that are based on product types can be represented with sum types, and that sum-type functors are not in general representable (example: the list functor). Finally, notice that a representable functor gives us two different implementations of the same thing — one a function, one a data structure. They have exactly the same content — the same values are retrieved using the same keys. That’s the sense of “sameness” I was talking about. Two naturally isomorphic functors are identical as far as their contents are involved. On the other hand, the two representations are often implemented differently and may have different performance characteristics. Memoization is used as a performance enhancement and may lead to substantially reduced run times. Being able to generate different representations of the same underlying computation is very valuable in practice. So, surprisingly, even though it’s not concerned with performance at all, category theory provides ample opportunities to explore alternative implementations that have practical value. Show that the hom-functors map identity morphisms in C to corresponding identity functions in Set. Show that Maybe is not representable. Is the Reader functor representable? Using Stream representation, memoize a function that squares its argument. is representable. Can you guess the type that represents it? Implement tabulate and index. The Catsters video about representable functors. Where you say “It requires that there be an object a in C; one natural transformation α from C(a, _) to F;” F is any functor? F is the functor from the definition: “any functor that is naturally isomorphic to the hom-functor, for some choice of a, is called representable.” I’ll edit it to make it clrearer. Hello! Suppose that for a fixed “a” in C(a,-) there are two objects, “x1” and “x2″, for which there are no arrow from ” a”. This means that Hom functor maps these object to empty sets. My question is: are these empty sets considered to be the same object in Set or are they distinct Set objects (albeit with the same internal structure)? @Leonid: There is only one empty set in Set. Is that caused by a change in Haskell syntax since this blog post was written? Confused by what qualifies as a “set-valued functor”. The examples provided in this chapter are List and Stream which are objects in Hask, not Set, no? Hask can be treated as Set, if you ignore the bottom. If you want to be really rigorous about it, it’s not even clear if Hask is a category. I’m glossing over these issues, since I use Haskell mostly as a source of intuitions for explaining category theory.